Part Used : Stem, Fruits, Leaf, Seeds. 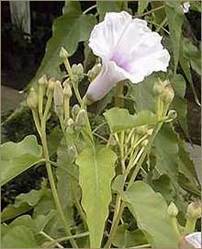 Uses : One of two tree-like perennial morning glory species, it grows to a height of 5m. The stem is thick and develops into a solid trunk over several years with many branches from base. The leaves are light green, heart shaped or somewhat lanceolate and 10-25cm long. It acts as toxic to cattle. It is reported to have stimulatory allelopathic effects. Roots are boiled to use as laxative and to provoke menstruation. Traditional healers for treatment of skin diseases have used it. The milky juice of plant has been used for the treatment of Leucoderma and other related skin diseases. Only external applications have been recommended due to poisonous nature of the plant. It has depressant effect on central nervous system. Also shows muscle relaxant property.